A few weeks ago I was out at a bar with my best friend and I was hungry and I saw something on the menu that I had never ever heard of. Right there on the menu was a beautiful picture of spinach fries. I ordered them and oh my lord they were delicious. However, there is no way I could pay $9 for a single serving of fries again. So I decided I was going to figure out how to make my own. 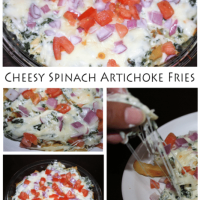 Let me tell you my version of these Cheesy Spinach Artichoke Fries way better. 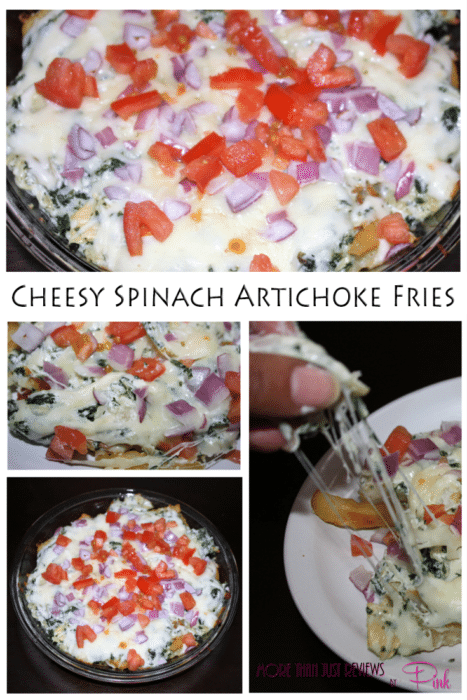 I would have never ever thought of putting spinach on french fries. This dip is also great with tortilla chips or ciabatta bread. This would also make a great Superbowl party appetizer. Prepare enough fries for 8 servings to package directions. Mix sour cream, miricle whip, parmesan and mozzerella cheese, garlic, and spinach in a bowl. Put fries into a shallow pan. Top with artichoke dip and onion. Top with tomato and enjoy.